Hindutva and Hypocrisy: Who Are We To Condemn Anyone? 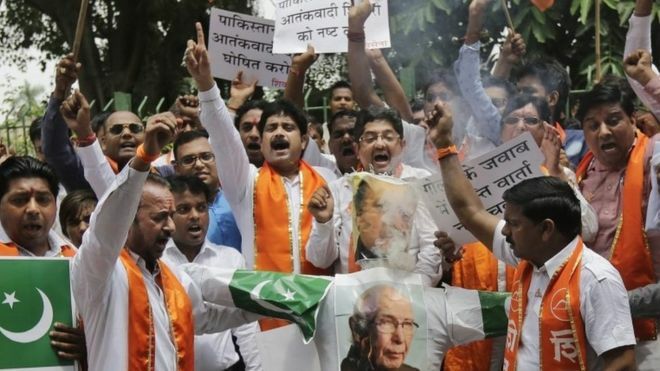 India’s hypernationalist religious extremists has become the number one story in Pakistan as the ink attack against Sudheendra Kulkarni has proven to be only the opening act of the Hindu extremists against Muslims and other religious minorities. Social media is now over taken by trends like #ExtremistIndia and #ModiBehindShivSena and #BoycottBCCI among others. Punjab Assembly even tabled a resolution against Shiv Sena’s religious extremism. Based on this reaction, one might believe that India’s shameful behaviour has held a mirror to Pakistan and made us realise that religious intolerance and militancy have no place in a civilised society. One would be wrong. There is a German word, “schadenfreude”, which means ‘pleasure derived by someone from another person’s misfortune’. Pakistan is currently enraptured by a national schadenfreude due to India finding itself facing international embarrassment from its own religious hardliners. Everyone is quick to condemn these horribly acts, and rightfully so. The problem is that the condemnation comes with a smirk. You see, we are obviously outraged by the treatment of Muslims in that country. So when a Muslim politician (from Indian-occupied Kashmir no less!) has ink thrown in his face, how can we react except with outrage? Is our case not made perfectly that Kashmir can never be part of India if this is the disrespectful way that Muslim politicians are treated? That Two-Nation Theory is proven beyond all doubt? However, we have no answer to the fact that in DG Khan a Muslim politician was targeted not with ink, but with a suicide bomb attack that killed seven innocent people and injured a dozen more. We loudly condemn the lynchings of Muslims for the mere fact of eating beef (a practice that can be found among Hindus also let us not forget) and ask what other affirmation is necessary to prove that Muslims required our own homeland? But we have no response to questions about what it means that over 11,000 Baloch have been killed or disappeared. We have no answer to questions about what it means that thousands of Shia have been slaughtered by extremist groups with almost total impunity. Since the last 10 months alone, almost 600 innocent Pakistanis have been killed by religious extremists, majority of the victims innocent Muslims. If Muslims are not safe in India, what are we in Pakistan? The rising incidents of Hindu extremism in India are a dangerous trend that must be immediately addressed by India’s government, and the international community should take notice. The UN should pressurize Modi to crack down of the extremist threat before any more innocent lives are lost and what has started as a national shame grows into a humanitarian crisis. In Pakistan, we should put away the smirks and the schadenfreude that we use to laugh at India’s misfortune while ignoring our own. We cannot condemn India for treating Muslims as second-class citizens as long as the Second Amendment makes Ahmadis second-class citizens in our own country. We cannot condemn Indian politicians for keeping close to Shiv Sena and RSS thugs for their own political ends while our own politicians are keeping close to ASWJ and JUD thugs for their own political ends. We cannot condemn India for failing to be a secular nation while we reject secularism ourselves. Condemning India for having the same failings as we doesn’t justify our own problems. It just makes us hypocrites. This entry was posted in Blogs and tagged extremism, india, rss, shiv sena by Mahmood Adeel. Bookmark the permalink.